Related work by Marcel Duchamp 1920, replica @ 1964. This entry was posted in Uncategorized and tagged Bereavement Twister, death, Mourning by Michael St.Mark. Bookmark the permalink. thanks for the explanation re-the photo. I’ve been in a vortex of grief myself before today and you’ve summed it perfectly up by describing it as a terrible whirlwind of sadness and loss. I guess the depth and the strength of grief is different for everyone and is hard to put into words if we are asked to describe it. My grief when my babies died has always been indescribable, a sort of falling down into a black hole from which there was no way out—-a terrible, heart wrenching experience i wouldn’t wish on anyone. Yes, its a part of life, grief is the mind’s outlet, way, process, of coming to terms with loss. It needn’t be death either, I’ve had one or two terrible periods of grief when a loved one has left – they may as well have died, they did die, from my life. Some do “come back to life ” later though..
thank-goodness for friendships re-kindled i say, true friendship is priceless and something to be treasured no matter how many years pass without a ‘meeting up’! I value my friends very highly—–and that includes you too! I’ve never really looked on a breaking up of a realationship as a ‘death’ before, but you are right that is what it is. If a person you love leaves you then they are lost to you and the emotions and feelings are the same as an actual bereavement. I’ve looked at the photo for quite a while trying to decide what i make of it! In the end i came to the conclusion that whatever i say about it will be wrong, but what the heck does it matter in the end? It’s just me giving an opinion! It’s a very interesting photo and i would love to know how you achieved it. As the title is ‘Bereavement Twister’ to me it evokes thoughts of a soul going on it’s way up to Heaven after the death of it’s ‘owner’. The morose-looking girl in the image was walking arm-in-arm with an older woman, presumably her mother, by the old dockside at Annan in Scotland in 2007. They were moving very slowly, hunched over against the biting wind, heads down and with incredible sadness etched on both their faces… instinctively I sensed they had just lost someone very close ( possibly the father ). They seemed to hover around a large warehouse at the end of the docking basin for a few minutes, then make a beeline for my camper .. within which I was seated having my High Tea, as ye do. 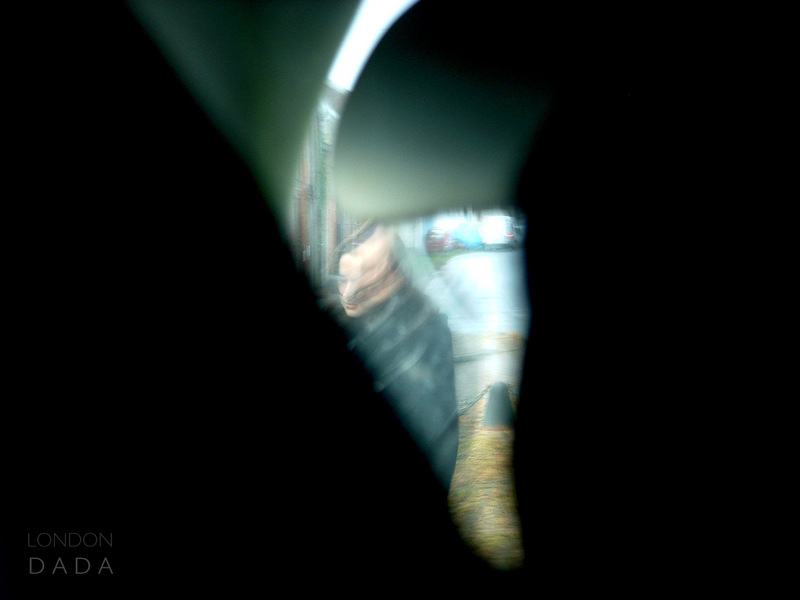 I took the picture in low light through a gap in the van’s curtains as they passed, without really being certain how it would turn out. It ended up capturing the girl’s face & coat only.. but I think the sadness “shines” through. The gap in the image takes the form of a tornado or twister, synonymous with the terrible whirlwind of sadness and loss that runs through the minds of those freshly bereaved. The Duchamp work… now that IS mysterious. He specified that the window panes of Fresh Widow be fashioned from black leather and must be polished daily.